When we hear the word website branding we generally think of a logo. But there is a lot more that goes into a brand than just the logo. Although the logo is very important, it’s just not everything. The logo is just the image that people will associate with the company. But in terms of the feeling people will get when remembering the company, it will be a combination of all the different pieces that give the company it’s brand. So for instance when you see a person, he has a certain style of clothing. That’s just piece of a person though. Then there is the way that person talks, and the way the person walks and thinks. All these different components of a person are the way we sum him up into his ‘brand’. Being creative in branding is absolutely essential because uniqueness will be how you are remembered as opposed to your competition. Distinguishing your brand from other companies that are doing the same thing as you may make the difference in the end. The amount of factors that goes into buying something stretches deep in the recesses of our mind. In any marketing done, there is an intense amount of psychology taken into account for this reason. Often the decision of purchasing a product from a company may come down to pieces that a person may not even be able to articulate. How then can you try to take into account the parts that hover beneath the surface? I believe the answer comes down to the same factors that make us trust a person. The reason for this is trust. Consistency is an essential determining characteristic that makes us trust someone. Then from there to be able to commit to them in some way. This is because you can come to understand them and expect them to respond in certain ways. So all the pieces of a brand must be consistent with each other so people receive a clear message. A company wants there customers to understand what they are about. So if a sports company wants to be fierce, they must have a fierce logo, and a fierce font, and a fierce color scheme. All the different constituents that create the entire identity of the company must be clear and congruent. Website branding is meant to highlight the vision of the company and their identity. Whatever lies to at the core of what a company was built for should be expressed through every avenue of expression possible. More than that all the parts that are being expressed should be conveying a similar message so customers can identify with your brand. Consistency gives people something they can understand and relate to. We all aim for this consistency in our own selves, it’s integrity. This is because when the all various parts of ourselves our consistent they are all integrated. So we sense one clear and identity bursting forth from a person. And with that, there is a lot that draws people in. A company should function in the same manner. 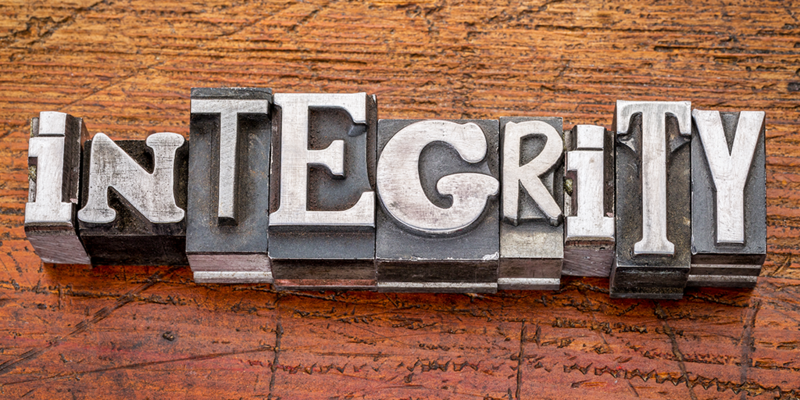 Integrity gives customers something they know they can count on. And often that’s what they need to make a purchase.